After 4 months of brown winter when you finally see the spring bloom with wonderful weather, it almost feels like some Artist painted a blank canvas with color. It was exactly the same feeling when I discovered raw mango by Sanjay Garg creation. With all the bling designs in the market raw mango is a new kinda traditional take yet the feel is contemporary. I bought this parrot green chanderi saree long time back when raw mango sarees are not easily accessible as today. Every time I wear this saree, I fall in love with it all over again. 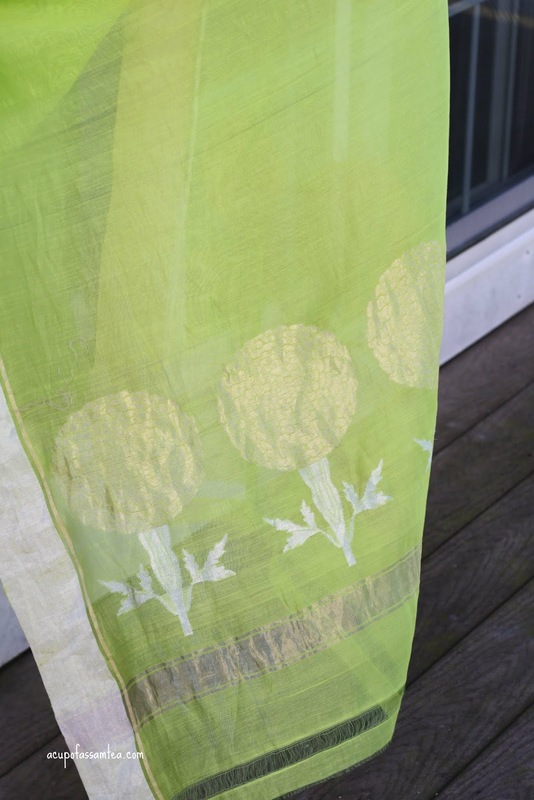 This is the signature of Raw mango sarees. If I want I can go for more shuttle look, but opted for a more bright look, added Manish Arora colorful large earing and blue blouse and blue silk potli. Brown Smokey eyes, bright lips, and a loose bun. Do let me know how you like it. I love your styling and love your saree, you look stunning. The combination of blue and parrot green is so charming. I super love this Saree, the color is so gorgeous wow! I don't like it, i love it. The blue goes perfectly with the bright green! It certainly reminds me of spring! 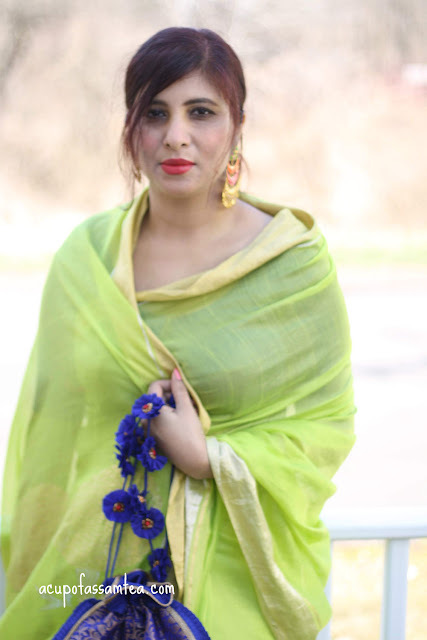 I have never had the pleasure to put on a Saree before but looking at these images made me take out my Saree that I bought while on vacation years ago, just hope it still fits.Thanks for sharing. That is really gorgeous! I love the design on the bottom! WOW! Such a beautiful outfit. The detail looks absolutely amazing!! Those are gorgeous colors on you!! Looking gorgeous, Just love you fashion style. 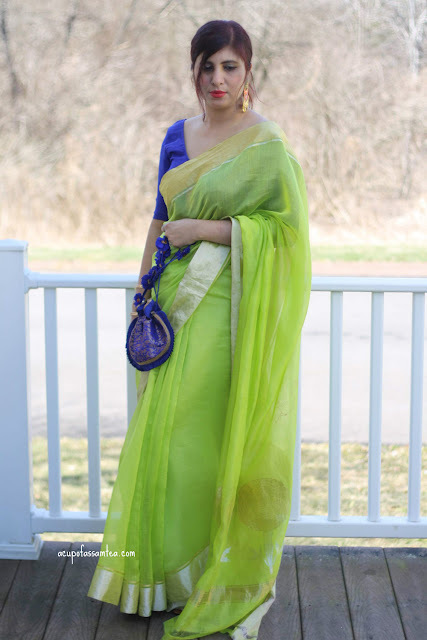 I really love the color of this saree. The green looks amazing and stand out and great for photo shooting. I hope it is not too difficult to wear like kimono. wow! your saree looks fantastic! that color! so splendid, I absolutely love it. You wear it with so much grace! Love the colour. It's so eye catching. Sarees always look Glamourous. I love how artistic and rich in culture this dress show. Very intricate and elegant. It looks nice on you. What a stylish way to welcome spring! I love the color and the intricate print! I really love the colors! You look very lovely! Wow, those are beautiful and it really looks good on you and I also love the elegant color and a head turner design of that saree, pretty! You look so so stunning! Love the outfit on you, it really works for you. Thanks for the post. You have pulled it off pretty well and are looking absolutely stunning in this !!! Love the color as well . I am obsessed with these bright colors and those earrings!! You look so pretty! You look stunning! I love the colors! You looked so stunning, I love the color of your saree.. It look so fresh.